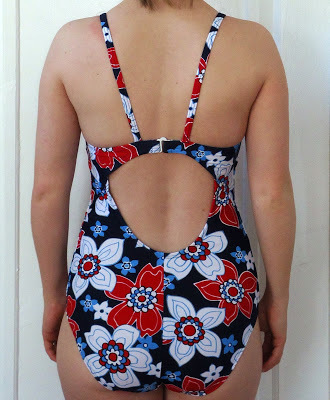 Welcome back to the Swimsuit Sew-Along! I finished my swimsuit! 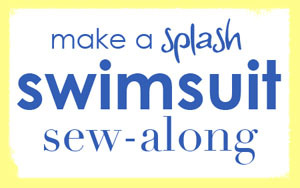 But before I show you finished pictures, let me share a few more tips for sewing your swimsuit. If you missed it, I already went over cutting out and inserting your lining. The feed dogs grip the elastic better than they would the fabric, which would end up sliding around and give you a really hard time. This is, perhaps, the most useful tip I found while doing research for this project. I zig-zagged the two together with a Jersey Ballpoint Needle, then folded it over and topstitched with a Stretch Twin Needle. 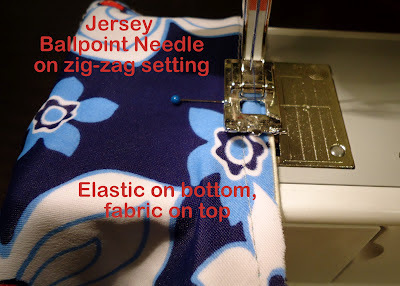 I know I talked about not using pins with swimsuit fabric but I just had to on this step! It really helped to keep the elastic in place and well-spaced while I was sewing it to the fabric. If it is any consolation, I did try to keep my pin punctures within the seam allowance. As you can see, above, the zig-zagging is visible on the wrong side, and the pretty double-stitching is visible on the right side. I broke my twin needle on a pin just as I finished sewing the last stitches on the suit. *TEAR* I was hoping not to have to dish out another $5 on the needle for my next project! 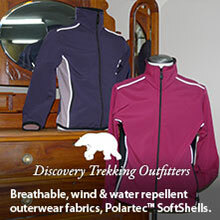 I used plush-back elastic for the shelf bra, which is really comfortable and won’t chafe against my skin. I found the bra closure at Joann’s and was surprised how easy it was to insert. I love the lower leg openings. I love the higher neckline and that the straps are farther from my shoulders. I attached the shoulder straps closer to center back than directed by the pattern and love that these babies will not be going anywhere! When I use this pattern again, I will make a small bust adjustment and get rid of the fullness in the shelf bra. The lining keeps riding up and poking out of the neckline. Talk about annoying! Oh, and if you alter your neckline you will need to make sure to do some math calculations to determine the new length of the elastic needed at the neckline. It’s not hard, I just compared the XS and S neckline width and the elastic needed for XS and S necklines and estimated my new number. The fit of this pattern is PERFECT and true to the measurements on the pattern envelope. The pattern instructions were very clear and didn’t leave any room for me to wonder what do do next. The $12 I paid was worth every penny. I am so glad I bought a pattern for my first swimsuit attempt instead of trying to make a pattern from my old ready-to-wear swimsuit. It would have been a nightmare to figure out how much elastic to use. Let me just reiterate that a serger is totally not necessary for swimsuit sewing. I really thought I’d use it for more than just the side seams, but I had to use my sewing machine for the rest. A sewing machine is perfectly acceptable as long as you use stretch needles during construction. Even though this suit was meant to be a muslin, I love it so much I’m not going to make the same pattern again until this one wears out. I will, however, be making a tankini pretty soon here…I’ve just got to find some fabric. Here’s to your own swimsuit sewing success! Looks great Stephanie! I love your fabric. Very cute swimsuit and print. I would love for you to share your talents at Bacon Time's weekly friday -Monday linky. I'm very impressed. I've made leotards, but a swimsuit is not something I've ever even thought of attempting. Awesome job. Oh wow! You did such a great job and I love that there's extra enforcement for the straps (I hate when they fall down)! Re: pear shape. I feel like I'm the living definition of this! It makes finding properly fitting pants a bit of a nightmare. can you repair the elastic on my swimsuit? If you're having a problem with your elastic, you should take it out, and replace it with a new piece. Is it stretched out? Yes, the elastic does need to be shorter so that it will hold the neckline close to the body.